Every so often, in dentistry and other fields, a new technology comes along that promises to change the standard practices. TADS (Temporary Anchorage Devices) aren’t exactly new — orthodontists have used them since the 1980s — but they’re gaining widespread acceptance today. The benefits they offer some orthodontic patients could even be called groundbreaking. Let’s look at what these devices are, and what they can do. Essentially, TADS are small, screw-like dental implants made of a titanium alloy. As the name implies, they’re temporary — they usually remain in place during some months of treatment, and then they are removed. Their function is to provide a stable anchorage — that is, a fixed point around which other things (namely, teeth) can be moved. But why is anchorage so important? But to do its work, that force needs a fixed point to push against. For example, imagine trying to move the stick while you’re floating free in the water: Not so easy! But with two feet firmly planted in the sand, you can do it. When possible, orthodontists use the back teeth as an anchor — but sometimes, cumbersome headgear may be required to provide the necessary anchorage. In many cases, using TADS can change that. While it’s generally preferred, the use of teeth as orthodontic anchors can have drawbacks in some cases. For example, there may not be a viable tooth located at the point where an anchor is needed. Also, when a greater force is required, the teeth used as anchors can themselves start to move. This is one instance where TADS are beneficial: These mini-implants can eliminate the need to use teeth as anchors, or stabilize a tooth that’s being used as such. Like dental implants (which have been in use since the 1970s) TADS are small, screw-like devices that are placed into the bone of the jaw. Unlike implants, however, they don’t always need to become integrated with the bone itself: They can be fixed in place by mechanical forces alone. Plus, they’re much easier to put in and remove when treatment is complete. How easy? 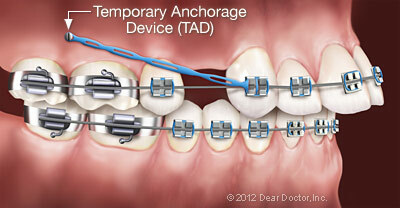 Placing and removing TADS is a minimally-invasive, pain-free procedure. After the area being treated is numbed (with an injection or other numbing treatment), a patient feels only gentle pressure as the device is inserted. The whole process can take just minutes to complete. Afterwards, an over-the-counter pain reliever can be taken if needed — but many patients need no pain reliever at all. And taking TADS out is even easier. So if you’re worried that it may be a painful procedure: Relax! It’s far less stressful than you may think. While they’re in place, TADS require minimal maintenance. Generally, they should be brushed twice daily with a soft toothbrush dipped in an antimicrobial solution. You will receive specific instructions regarding maintenance when your TADS are placed. Not every orthodontic patient needs TADS — but for those who do, it’s a treatment option that offers some clear benefits.